Shakhtar Donetsk midfielder Fred says both Manchester United and Manchester City are interested in signing him. United have made enquiries for Fred and Shakhtar reportedly rejected City's 50m euros (£43.7m) offer in January. "There was a possible transfer to City. Shortly after, both clubs - City and United - talked with Shakhtar and with my agents about a possible transfer," said the 25-year-old Brazilian. "If I am not mistaken, there was news on Thursday of a strong bid by United." 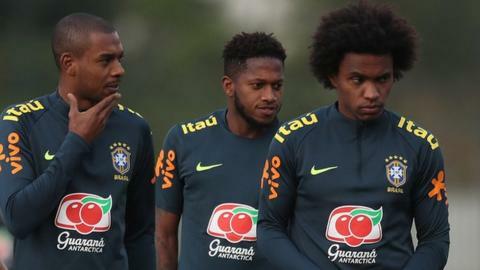 Fred is in Brazil's World Cup squad and is expected to travel to England this weekend as the national side build up to a friendly against Croatia on 3 June. The former Internacional player added: "I am focused solely on the World Cup. My agents are taking care of this." Referring to City boss Pep Guardiola and United manager Jose Mourinho, he added: "It's an honour to be on the radar of great European coaches. "I have a versatility on the pitch and I'm a multi-skilled player able to play in both midfield positions. I believe some coaches need that with their teams." In December 2015, Fred was given a one-year ban for testing positive for a banned diuretic, which was backdated to June that year when the test was carried out. The suspension only applied to games sanctioned by South American football federation Conmebol.